It’s absolutely fair to appropriately critique the standard of play against the standard which has already been set by the competition. However, asking coaches to prepare their teams in a certain way is disingenuous, does not allow the game to develop naturally and at its own pace, and does not take into account any of the other results on the weekend, which saw much higher scores than in the inaugural season. Isn’t it also a slight overreaction to pen such a memo after only one weekend of the competition? I’m used to below-par games in all the codes I follow every now and again. Perhaps it would be more appropriate to allow things to get into full swing before telling experts how to coach? Let’s see what Round 2 will bring – I hope to see plenty of you out there at Drummoyne tonight! The NRL announcing its women’s competition in December last year demonstrated just how far women playing the game had come in a short space of time. In 2017 we saw the Australian Jillaroos beat the New Zealand Ferns on every occasion that they met (including at the Auckland Nines and at the Test match in May). Several Jillaroos made their debut last year, including Jessica Sergis and Talesha Quinn. The Tarsha Gale Nines was launched and the Cronulla Sharks began their own 9s competition. Additionally, Ruan Sims penned a deal with the Sharks, becoming the first woman to sign a professional NRL contract. The cherry on top was Australia beating New Zealand 23-16 in the Rugby League World Cup Final to be crowned champions. 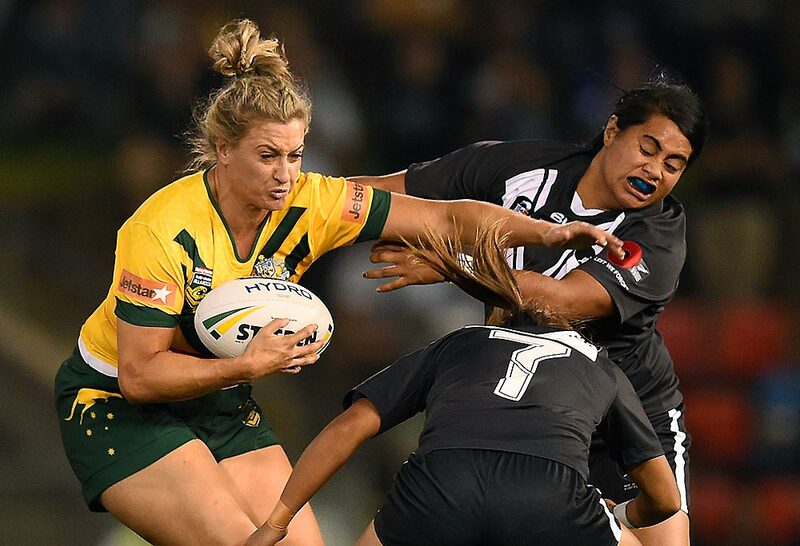 This year, there is plenty to look forward to, including 40 Jillaroos to be contracted, a new women’s competition, and the transformation of the Interstate Challenge into State of Origin. In terms of the new competition, we are at a stage where NRL clubs have been asked to submit an expression of interest for a team by mid-February. As many of you know, I support Parramatta, but I found myself thinking when the competition was announced that I wouldn’t be disappointed if the Eels did not field a team. I know how much preparation, infrastructure and careful thinking an additional team means for a club. So while I want the Eels to have a team and be supportive of women who want to play rugby league, I would completely understand if they didn’t think they were ready by 2018 – particularly when I know there are other clubs (like the Sharks and St George Illawarra Dragons) in a much stronger position and more advanced on their journey. The Newcastle Knights were another club I thought would be well ahead in preparing for potential inclusion – particularly considering how many current Jillaroos are from the area, like Isabelle Kelly, Caitlin Moran and Bec Young. The Knights have submitted an expression of interest, but it will all hinge on whether entering a team will be cost effective. This suggests Newcastle (and other clubs) may not have been as progressed on the journey as I thought. Wests Group and Knights chief executive Phil Gardner says he expects a women’s team to cost the club $500,000 – coming on top of what’s to be spent on their NSW Cup team and under 16s and 18s squads. While I see a women’s team as a worthy investment, I can completely understand this perspective, particularly in an environment where most clubs operate at a loss. I am thrilled the NRL has announced a women’s competition but it is so important that this is done right. I am confident the governing body will work with the interested clubs to ensure they are supported and set up for success. But if the clubs need financially backing, this is also a great opportunity for sponsors to raise their hands. We hear so much about how this is a ‘watershed’ time for women in sport, so isn’t it time corporate Australia started to put some money behind it too? It’s time for some big talkers to walk the walk.